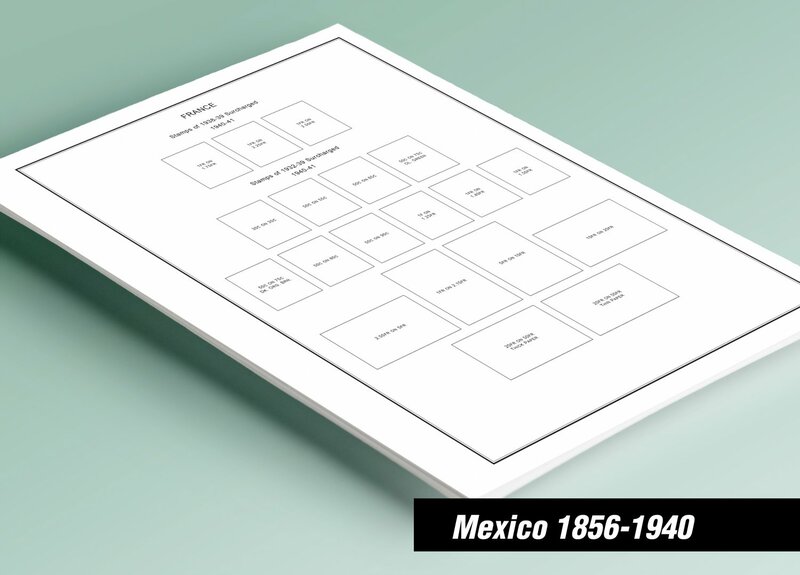 Non-illustrated printed pages for Mexico 1856-1940. The stamps are ordered according to Scott catalogue (for copyright reasons, Scott numbering isn´t displayed in the pages). Top quality non-illustrated stamp album pages printed on heavy stock 170 g/m2 (65 lbs cover weight) acid-free couchet silky white paper. US letter size 8.5 x 11”. Features Miguel Hidalgo y Costilla issues (including without district overprint), coat of arms, Denver issues, Coach seal issue, Oaxaca issues, perforate, pin-perforate & imperforate stamps, perforation size varieties litographed, black and colored watermarks, types of paper (thin gray blue. thick wove, thin wove paper, lined paper), numerals, embosses, overprints, surcharges, imprints, semi-postal stamps, air mail, air post officials, special delivery stamps, insured letter, postage due and "porte de mar" stamps, officials, postal tax, parcel post, revenue stamps used for postage, Sonora typeset issues. PROVISIONAL ISSUES: for Campeche, Chichuhua, Guadalajara, Sinaloa. These are non-illustrated black & white printed pages. They are NOT hingeless. For protection of both the pages and the stamps/sheets, we recommend using stamp mounts instead of hinges. The pages are sent unpunched – this allows you to punch them as needed (for 2 or more ring binders).